The latest vending machine invention. 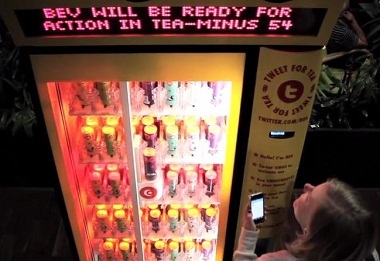 This Twitter- powered vending machine is from the brand BOS Ice Tea, a South African company. Launched in Cape Town, this vending machine lets the user simply send a tweet #BOSTWEET4T and a free can of BOS tea rolls out! Great combination of social media and a real life situation, simple and effective!